Police clearance certificate will declare you as a good citizen and you will not face any problems when you go to another country. Applying for this certificate is very important if you are leaving Saudi Arabia forever and do not plan to return again. 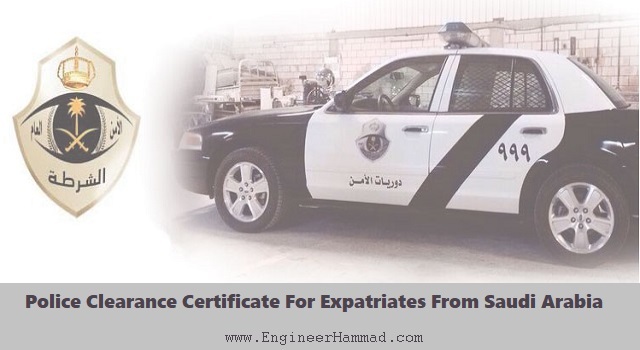 If you are planning to move from Saudi Arabia to another country then you will need police clearance certificate as an expatriate. The procedure has been made much easier and it will basically involve checking your criminal record and certifying that you are eligible to travel. Police clearance certificate will declare you as a good citizen and you will not face any problems when you go to another country. Applying for this certificate is very important if you are leaving Saudi Arabia forever and do not plan to return again. It is much easier to get it before you leave the country. *Trending: Now Women are allowed to drive in Saudi Arabia. You will need to apply for an endorsement letter from your embassy. Send them Iqama copy, completely filled application form and endorsement letter fee. You will need to wait for 1-2 weeks for this endorsement letter. You should get this endorsement letter attested from the Ministry of Foreign Affairs (MOFA). Submit attestation fee (100 Saudi Riyal), application form (available at MOFA), photocopy of passport, photocopy of Iqama and original endorsement letter. Enter your fingerprints in the MOFA system for their records. This step is very important for later verifications. Riyadh Deira Police Station (Near court). Dammam Police Station (located opposite Governor house). Jeddah Police Station (located behind Islamic Development Bank). Once you have submitted these documents in any of the above police stations, they will inform you about the date when you can come back to collect your police clearance certificate. You will personally have to visit the same police station again to collect your police clearance certificate. So, in these 5 easy and simple steps you can get your police clearance certificate before you leave Saudi Arabia. It is important to understand that once you are outside Saudi Arabia, you will have to follow a different process for obtaining police clearance certificate. That process is longer and more difficult. So while you are preparing to leave the country, you should plan to finish this task before you go. *Trending: List of companies for job hunters in Saudi Arabia. If you follow these steps, obtaining a police clearance certificate should be very easy and simple. You will have to wait after step 1 and 4, but it is worth the wait because you will get the original letter. *Trending: Email list of companies for job hunters in Saudi Arabia. You do not need to pay an agent or any other person to get the police clearance certificate for you. You will need to enter your own finger prints, so it is better that you perform the process yourself. *Trending: Ministry of Labor launches KAWADIR job portal for expats.